“With tensions growing over North Korea, the Self-Defense Forces carried out a mission to protect U.S. vessels and aircraft for the first time,” Abe said. “An alliance gets stronger if the partners can help each other. The Japan-U.S. alliance has without a doubt become stronger than ever,” he declared. 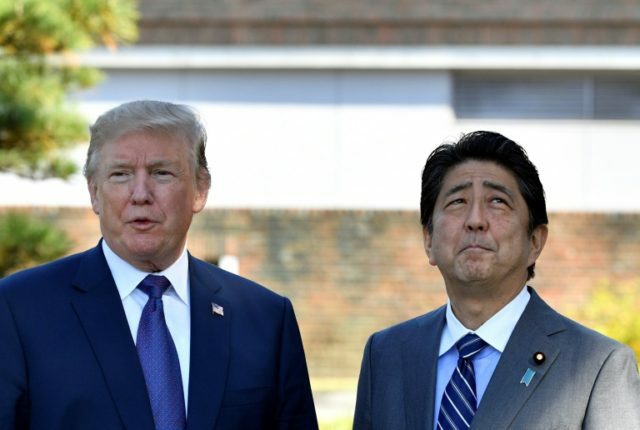 Stars and Stripes described Japanese officials as “tight-lipped” about the operation Abe referred to, with several high-ranking defense officials refusing requests from reporters for more details. The U.S. military was no more forthcoming. Without much to go on, Stars and Stripes theorized Abe might have been alluding to a mission last spring where a Japanese helicopter carrier escorted a U.S. Navy vessel to resupply one of the warships protecting Japan from North Korean missiles. That seems a bit less remarkable than what the prime minister alluded to, or perhaps that mission was more exciting than previously reported. One reason Abe addressed the Diet on this subject is that laws allowing Japanese self-defense forces to protect Americans and other allied forces only went into effect last March. Before that, it was only legal for Japan to defend allies ships, planes, or ground forces if Japan itself was also under attack. There was considerable unhappiness among the Japanese public that Abe implemented this policy change, and perhaps more importantly, policy changes that allow Japan to deploy its forces overseas, without amending the national constitution. Abe has long expressed a desire to reform the pacifist constitution but felt the urgency of the North Korean threat called for some changes to be implemented more quickly. Japan may take some comfort from the Pentagon’s report this week that American defenses against potential North Korean missile attack have improved. The report’s optimism was buoyed by what it described as a nearly flawless test intercept in May of the most realistic ICBM target missile employed to date. However, critics still believe testing has not adequately simulated the difficulty of taking out a live weapon employing defensive countermeasures.